Sir – Fracking has no social licence yet. The social licence to frack for gas promised by the NT government will not be earned by using more taxpayer’s money to overstate the short term benefits, minimise the risks of fracking and ignore renewable energy options. Many of the concerns in our statement “Fracking is too risky” in May have still not been addressed even after our personal discussions and correspondence with NT Chief Minister Adam Giles and the mining companies Central Petroleum and SANTOS. Without serious responses to these serious realities and risks there is no social licence. Companies and the community want certainty. No one wants a stranded asset pipeline blotting our beautiful landscape. No one wants contaminated water. No one wants to pay forever for ever increasing air-conditioning costs for gas induced higher temperatures across Central Australia. So respond reasonably to the following risks, or make the switch to renewable energy options and jobs. When will we see the promised regulations to minimise fracking risks? Will there be time for public scrutiny and change before approving fracking? Who monitors fracking operations? Will monitors include those who do not support fracking to ensure wider community confidence, transparency and social contract? Will there be unrestricted 24/7 access? Will all the pre and post results of water, soil and air testing be publicly available? Will this cover the actual chemicals used? Will there be transparency of decision making? Will there be ongoing involvement of traditional owners? Is there an independent umpire or review body with no conflict of interest? Are there strong legal sanctions to prosecute violations without delay? Will whistle-blowers within companies, government or wider community be supported by legislation? Can government employees or those on contracts share their views without risk of retribution? How do we decontaminate underground water and who pays for it? Are rural and remote NT landowners and communities being made sacrifice zones for business and government benefit? Who pays the increased costs from climate change increases? It’s all part of the bigger question. Who benefits and who loses in Central Australia and around the world, now and in the future, from fracking NT gas? When will we transition to a cheaper healthier renewable energy economy if not now? Let’s carefully consider how we change our world before it changes us. Funding and approval to build a gas pipeline to the Eastern states for export opportunities needs to be carefully considered by all Territorians within the reality that millions of people worldwide are realising that the fossil fuel economy has negative impacts on our planet and millions of people. This challenge is strongly reinforced by people like Pope Francis speaking “On Care for Our Common Home” and Canadian Naomi Klein author of “This Changes Everything” with the movie that premieres at the Alice Springs Cinema on Thursday, November 5 at 6.30pm. @ Kenneth: The scientific method is a body of techniques for investigating phenomena, acquiring new knowledge, or correcting and integrating previous knowledge. Experiments should be designed to minimize possible errors, especially through the use of appropriate scientific controls. Once those experiments prove the hypotheses correct, the ethics and moral issues must be involved. Exemple: CERN is due to re-open the large hadron collider in order to recreate the big bang, despite warnings from top scientists such as Stephen Hawking and Neil de Grasse Tyson. Recent developments prove to us the scientific community is no longer able to explain reality without looking at the supernatural. I’m afraid the phrase “Catholic Social Justice Awareness Group” is passe to the point of sounding ridiculous. Why not use something like the Provisional Front for the Perpetually Offended? Same meaning. While the exploitation and extraction methods of our national assets such as gas and coal must be assessed for both potential benefit and also possible environmental damage, this assessment must be carried out by scientists / geologists. The perpetrators of mythology and make believe (religion) should play no part in this process as superstition and science do not mix. The fact the Catholic Social Justice Awareness Group aka Popular Front are trying to influence a voting population based on the demonization of a particular extraction process called fracking (soon to be replaced by microwaving which is far less invasive) shows either the degree of their ignorance or makes me ask the following question: Which foreign government is influencing your Popular Front? Don’t underestimate the interference and influence of foreign governments or big businesses on your own markets when it comes to competing with your product and their desire to compel you to use an inferior product for their own nefarious reasons. The above statement – if viciously attacked – will be considered a marker in its accuracy. Chris Hawke, how far did you go in school? If you had any technical expertise you would not use clichés instead you would a balanced science discourse. Do you realise there is such a thing as a scientific method and basic science when important matters are investigated? Science in the present era is critical in result forming. Of course you do not for your discourse is quasi-intelligent set up to fool yourself. It is highly political of sectional unbalanced scare-mongering. You are not an expert at anything or else you would balance your thoughts with evidence and derived conclusions of your own. Hmm. The previous comment seems to imply that the politicians are good at politics. Is that a joke? The Catholic Church should stick to what they are good at. Leave the politics to the politicians. As a long time investor in the company concerned I worry about the liaison between this Government and the dominant company involved in the gas industry. CTP claims that the only viable route for a connector pipeline is via Moomba directly over the Simpson, leading to the inevitable question who is running the show and in whose interests – Government or CTP? The two are not necessarily compatible. This is irrespective of the pros and cons of fracking. It has not been disclosed to the public that should the proposed inter-connector to the Eastern states via the Simpson go ahead, it would be very near to the massive coal deposits under their licensed areas near the Colson track, and thus expose this to massive exploitation for either gas or coal. I remember well the struggle for board control of CTP a few years ago when a certain rotund mining magnate now Federal Parliamentarian tried to take control of the CTP board in order to gain access to those coal measures. I was also at Old Andado when the then chief of CTP, John Heugh, arrived back at Molly’s by helicopter with his soil samples and proclaimed loudly “we’ve got it”, referring to gas. This is what the pipeline thing is really all about and without fracking there is an economic problem. I spoke at length with Heugh at the AGM in Perth about that time and there was brief mention of a railway from there to the east coast by the same rotund aforesaid gentleman. This was and still is the ultimate aim of the pipeline debate and ultimately fracking. The really sad part of the whole affair is the lack of foresight by the present Government and failure to read the signs. Within years over half of the cars in this world will be electric. What of the tourists who want to travel by road to Darwin in their electric vehicles? The obvious answer, in spite of Steve Brown’s proposition of cost, is to take advantage of our natural resources apart from fossil fuels, and based around Tennant Creek. The need for a complete utilities corridor between Tennant and Isa is so obvious. It would encompass the proposed train link, a gas pipeline and an electricity inter conductor just has happened between SA, NSW and Victoria. Then add the significant phosphate deposits in that area (we have 20 years phosphate left here, then what?). Then add 50 Squ KM of solar panels and wind generators around Tennant and who needs gas or coal? This is not pie in the sky stuff, but is happening in other parts of the world as we speak and who knows what the technology will be in 30 years. We are all speaking of 50 year old technology currently and assuming that it will remain so. Already Germany has carbon nano tube conductors with little or no electrical resistance for such long term transmission purposes and look at the recent solar car battery technology. Why do we constantly look backwards instead of looking around at what else is available or possible? I look forward to my grandchildren travelling from Adelaide north in an electric train powered by renewable energy. Once more we will be left behind just as we have with food production, in the face of massive increases in demand. @ Dan: We are not alone on the planet! That our existence in this place is completely reliant on others elsewhere. Beginning with the food that we eat. I take it from your comment that your present concept of a social conscience extends no further than your own self-interest and your own immediate surrounds. You might find it prudent to give that a little more thought. The facts are that a switch to renewables is neither achievable nor affordable with present technologies without throwing the whole planet into chaos and out of work. That will affect you in a way you will not miss, especially around meal time. A switch to renewables is a great goal, however keep in mind that it will require the replacement of a very large part of our existing generation technology. It not only takes time to do that but an enormous amount of money! Where’s that money come from? Answer: it comes from you. Every bit of that change has to be paid for, not by big bad profit earning companies, but by individuals like yourself! That is difficult enough for wealthy countries like Australia to achieve but for many developing nations of the World it is beyond the bounds of possibility. So in exercising both your social conscience and your mind you will quickly come to the realization that progress to the point of total renewable energy is a very long way off. My 50 year guess is probably wildly optimistic! It will take time, barring of course the arrival of a revolutionary break through technology. We all hope that happens but hope doesn’t keep the world going. Practical solutions do. If you want to change that try coming up with the necessary technology. In the meantime cleaner fuels such as gas are a definite plus in reducing carbon. So, of course, is nuclear power although this also has a lead time, I believe, of around 30 years to establish. So like it or lump it gas is going to play a major part in power production for many years to come and we in the Territory have huge quantities of it! You know what they say, make hay while the sun shines, if we leave it in the ground somebody will fill the gap with dirty brown coal, so try thinking of it as a civic duty providing the world with cleaner Fuel. As for my house, Dan, I run a swampy, six split systems, at least a dozen TVs, computers and fridges plus a civilized level of lighting at night because, Dan, I live in the 21st century not the bloody dark ages and I, like the rest of the world, intend to keep right on using those 21st century conveniences. I suspect you will find a huge majority of the world feels the same way, so if you don’t like it, I hear there’s a one way trip to Mars on offer. Take it up! @ Steve: All good. I still believe that fracking is destructive to the environment and above all fooling around with mother nature’s creations (aquifers) for economic progress is a no go zone! Steve: Do you actually understand that we (Alice Springs) are not responsible generating the world’s energy requirements? Do you understand that although we would all love to switch overnight to renewables that it will probably take less than 50 years for Alice to get near it and we in Alice Springs don’t have the responsibility to power the globe? Steve, we (Alice Springs) will not literally be putting billions out of work. We (Alice Springs) will not lose our technologies, our communications, our manufacturing, our transport and of course what we eat! We (Alice Springs) will not also literally starve billions to death! So the socially responsible thing, Steve, is to move towards our goal of only having renewables we can achieve this while phasing out fossil fuels. In Alice Springs we need to get moving and invest in that now, not pipelines to send polluting fuels around the globe. Do you realize that gas is one of the cleanest fossil fuels? But still dirty. So, in supporting the phasing out of its use ASAP you will actually producing less carbon than using coal or gas? Time to be socially responsible alright, Steve, think the issue all the way through! At what stage do you think exaggeration goes from being a possible depiction of an outcome to being deliberate deception? Why is Alice Springs responsible for the supply of fossil fuels to the world? So let’s keep it in perspective shall we. Alice Springs doesn’t have to supply the world with fossil fuels and contribute to the pollution of our atmosphere on such a large scale, we can become more and more efficient and develop alternative technologies. We are not responsible for the world’s energy needs. WE do not have to go with any sort of development that creates long-term problems just for a short term gain for some of our councillors and others involved in building industries etc. The kind of fracking that’s proposed does not have a strict monitoring and regulation in place. Any damage that is done is difficult and expensive if not impossible to repair. It does require millions of litres of water and the water that is used can be reused. But will you drink it, Steve? Sure, fracking has a level of risk as does just about every activity that takes place in our modern world but it’s either that, or into a responsible sustainable future. Are you switching off tonight Steve? OR are you leaving the lights on and wasting energy and contributing to the problem? Are you switching on to solar and the other technologies of the future or hoping to stay in the dark ages? @ Micheal: Please be charitable enough to accept that people other than yourself can make a contribution and comment about the future development of the town for reasons other than self interest! Just like your recent contribution on football, plainly in the public interest! The extension of the dump, should it go ahead is certainly in the direction of White Gums, but Micheal, as you should know very well, it is some 8km away from it! Having absolutely no bearing on the White Gums development whatsoever. What it does have import for, is the future development of the front door of our town. Heavitree Gap! Also for the future development of Blatherskite Park which is becoming ever more central to the town’s development and given your interest in football it should also be very much central to your own thinking. Further, if we were to start recycling our sewage, as we should, suddenly the entire Illparpa Valley becomes an immensely valuable piece of real estate situated slab bang in the middle of our growing community. Something that should be of great interest to yourself in looking after the interest of the TOs. What do you suppose is a more valuable asset, a very developable piece of land or a garbage dump? My biggest concern about further extension into this area is around aesthetics, the tourism and recreational potential of this area is enormous and as I’ve said before it’s slap bang in the middle of town. I would have thought that valuing and looking after this area would be very much in your interest. Micheal, I’m happy to meet up again anytime and talk about how we can further that community interest. The “Social Justice Committee” exhibit hypocrisy. Why are they not out in the town camps setting the understanding that is Christ? Why are they not out looking after the drunk Aborigines in the street who have lost their way? That would be “Social Justice”. Why are they not helping the oppressed and those in need of comfort in this community where children are oppressed by parents and do not go to school? It was the Temple people, the Pharasees, the Scribes, and the Sadducees in the time of Christ that called out “Crucify Him” who was the Son of God. Chris and committee, do not be hypocritical and set your task to SAVE. In the time of Christ it was the Temple mob that was more concerned with the Law, the politic and themselves than the common man who was oppressed. No point wasting time and energy with it all. I don’t support fracking or whatever “variations” the government and gas industry call it. I do support mining however. Only one thing is sure – Giles will do whatever he likes regardless of what you, him, her, I think. He is self interest, self interest and self interest. NT Buses, Government Printing Office, TIO, the Port, Power and Water will happen, all to name a few. Did he or his side kick listen to you on selling these? Were the NT’s best interests at heart? And you think “it will all be OK” with him and fracking, please. You want to stop this – then get rid of Giles and Tollner! One thing is GUARANTEED – this time in 2-3 years time: it will be “Giles who?” and he’ll be feeding of some public teat interstate somewhere. Hal: The short term argument would dictate that the decision should be made when the MARKET conditions are suitable. I.e. a recovery in gas industry’s profitability. What we have is POLITICAL conditions that are suitable. I.e. a “stuff-the-community” Chief Minister with a big bag of cash from the sell off of assets. Why is the NT taxpayer propping up the risk associated with investing in this problem-ridden industry? Who really thinks they’ll see many benefits? It is my understanding that one key, perhaps the main key, to using solar for base-line power has to do with storage. Would that be batteries? If so, then it’s a technical matter, and I have no doubt that with sufficient research and development the solution to this could be found in much less time than 50 years. As one commentator suggested, perhaps within the next decade. Unfortunately, I fear that the short term financial gain offered by gas will win the short term argument. That means that the gas pipeline will be built, and some form of fracking will be allowed. We do not own our planet, we are custodians and the words “give back” are important. The question is: in which condition are we going to give back our planet? We have the tools and ability to a degree to fix on top of earth, but what is unknown … is man capable of rescuing our water supplies after they have been contaminated? I also note that Steve Brown tenaciously opposes a town dump to be extended towards the west. Yes, and it is in the Honeymoon Gap direction because of environmental issues? I am a bit confused, Steve. There’s something about being lectured to by the Catholic machine that I find hard to stomach. I’m not sure what it is though. Not true. It is now well established that we can now generate energy cost effectively from renewable resources. Yes that is an opinion just the same as yours. In the end the market will decide. And you question “do you understand that although we would all love to switch overnight to renewables that it is actually going to take at least 50 years to get anywhere near it?” If we were as determined as we are to spend on arms I think we could do it in 10 years. I am confident that the rate of technological development in the last 10 years and the anticipated rate of new technology in the next 10 years makes a gas pipeline an absolute waste of time and money as well as being a blot on our natural environment. Well put, Chris. So many questions remain unanswered. Why don’t we put all our efforts into transitioning to renewables? It may save time, money and the world. The views of the group Chris is representing are fulsome and accurate. The distortions peddled by industry protagonists and their supporters do not reveal the real story. Hydraulic horizontal fracturing has NOT been conducted “for decades” around Central Australia as they would have people believe. The elephant in the room issue here is that of trust. We simply cannot trust that the incumbent government has either the capacity to evolve the “robust, regulatory regimes” implied by Dr. Allan Hawke in his report nor implement them. There is no evidence presented by the author or others that such processes are being developed or delivered. The language of government is slippery and misleading. How can we, the people, whose water supply is potentially at risk of contamination trust a government that is more focused on itself and retaining power than it is about delivering good governance for the Northern Territory? The need for greed has taken over this incumbent government’s political agenda as they sell off TIO, lease the Darwin Port, increase the number of poker machines in licensed premises, refuse an independent inquiry into potentially corrupt political party donations, preside over government agencies with a culture of bullying in the workplace and lost four of its own CLP Members to the Independent bench directly attributable to the arrogance, bullying and bluff of the current leadership. How can people trust that those in charge are really responsible or ethical decision-makers? We can’t afford to take the chance. What we can afford to do is to embrace the opportunities presented to us all from the renewable energy sector with it’s employment and product possibilities. Clearly, no-one believes this can achieved with the stroke of a pen. It requires the vision to be grown in people’s minds, research and development dollars invested and the trust in any processes developed as a result through a full, transparent consultation. The incumbent government simply pays lip-service to widely consulting with the electorate ahead of decision-making. What is patently obvious is that a decision is made by the upper echelons of the hierarchy. The veiled consultations might be being held but goes the government take heed of alternative viewpoints? How can THAT be trusted? There is much merit on both sides of the argument. Sadly, our national, and Territory economies are so compromised. The industrial base that I knew in the 60s and 70s is now long exported offshore. Do we make a simple light globe or even a match? No! Australia is reduced to little more than a mine in order to retain our standard of living. Yesterday I saw a Greenie’s bumper sticker: “Australia isn’t a huge quarry!” Wrong! We have left ourself in this position. First World lifestyle – Third World economy. Sadly Steve Brown is correct. Live with mining or head back to the cave! We have run ourselves out of options. The biggest mining boom in our history will be our nemesis. And where is all that wealth now? Our national and state governments are broke! Gina and Clive cannot have it all? No significant Future Fund as in Norway! But relax. China is coming to save us. @ Steve: Your incomplete quote from Jesus “give to Caeser what is Caeser’s, and give to God what is God’s” Mark 12:17 is apt. Aquifers, the climate and land are not “Caeser’s” to be given to the gas companies, they are as the interpretation here would be “God’s”. Therefore, we should not be handing over our future to these companies and the government should not be doing their bidding. Chris and the Catholic Social Justice Group have every right to be talking about this issue as the Pope himself has urged all Catholics to look after our collective home including water, climate and biodiversity in his encyclical Laudato si’. Although the photo is from Queensland, it is representative of the impact this industry has on the connectivity of land, let alone underground water systems. The misinformation campaign that we have been fracking in the NT for 40 years is completely wrong. It has been reasonably shallow vertical wells and not the horizontal, slickwater (undisclosed chemical laden mix with 10-20 million litres). It is different and you cannot in good conscience keep spouting that deception. Also, just to remind you of another factual error, the Dingo Field is a conventional gas well rather than the unconventional shale gas which requires fracking. The two are both very different and to say otherwise is again, deceptive. And finally, the good old adage – if it’s not environmentally destructive then it’s back to the dark ages. This is absolute rubbish. We need to be planning to get off fossil fuels, not ramping up our dependence on them. The world is moving towards renewable energy and we have an opportunity to be a world leader in this field. It’s not about living in the dark Steve, it’s about water security in a warming world. It is about minimising our impact as our population increases. It’s about doing more with less. The out-dated model of progress is waning. Destruction is not progress, it is destruction. We need to be gentler on the Earth and gentler on ourselves. No need to sit in the dark Steve, just turn the light off when you leave the room. Erwin, that image is not necessarily indicative of fracking. 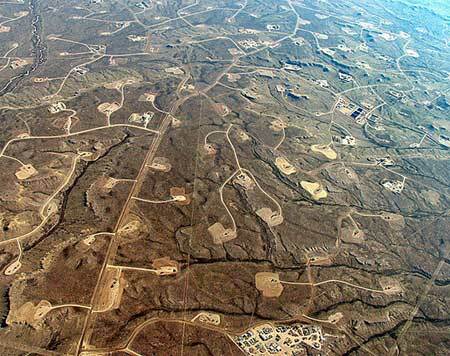 It is an image of a CSG field which is not what is being proposed in the NT. Fracking of deep shale (which is what is being proposed in the NT) looks nothing like this as Steve correctly pointed out. What was that quote in the Bible? Give to “Caesar what is Caesar’s”. In short, matters of state are not matters of religion. No substance is given to the argument about fracking or climate change by associating it with religion. I am also aware of a number of Catholics who are very unhappy with you pushing your political viewpoint under the Catholic banner. Further, your argument is put as being socially responsible in holding up renewables as an alternative while rejecting the use of coal and gas. Do you actually understand that as of yet we have not developed the capability of generating the world’s energy requirements by these means? Do you understand that although we would all love to switch overnight to renewables that it is actually going to take at least 50 years to get anywhere near it and in all that time we have to power the globe otherwise? Chris, we will literally be putting billions out of work. We will lose our technologies, our communications, our manufacturing, our transport and of course what we eat! We will also literally starve billions to death! So the socially responsible thing, Chris, is to move towards our goal of only having renewables at a rate we can achieve while maintaining all that is presently maintained by fossil fuels. Do you realize that gas is one of the cleanest fossil fuels? So in supporting its use over the next 50 years or so you will actually producing less carbon than using coal? Time to be socially responsible alright, Chris, think the issue all the way through! At what stage do you think exaggeration goes from being a possible depiction of an outcome to being deliberate deception? The photo shows over 100 holes in an area of just a few square kilometers the kind of drilling that’s going on in the Territory cost between $20m and $30m a hole, so the picture would extrapolate out to be somewhere between two and three billion dollars worth of drilling. If you were then to extrapolate that out to the size of the Territory we would be talking in figures as big as the world’s economy! So let’s keep it in perspective shall we. The Dingo Field, I believe has four holes and may at maximum have six. The kind of fracking that has been in use within the Territory for the past 50 years and is the only kind of fracking that’s proposed take’s place, is some two kilometers below the water bearing aquifers, it takes place under strict monitoring and regulation. It does not require millions of litres of water and the water that is used can be reused. It is not coal seam fracking that everyone interstate is in uproar about. It does not use benzines and other chemicals to gassify rock. Sure, it has a level of risk as does just about every activity that takes place in our modern world but it’s either that, or back to the dark ages! Are you switching off tonight Chris? You other Anti Frackers? I thought not. I agree 100% Chris, very well said. Giles and his government can’t be trusted, look at the sale of TIO. Something like 80% of Territorians were against it, but he did the deal before the community consultation process even closed. The PM is talking about a plebiscite on gay marriage, why can’t we have one in the NT on fracking? Giles and Co need to take this to an election and let the voters decide! What fairy land do they live in? It is beyond belief that they feel that can just rush such a massive and divisive project through without letting Territorians have a say! Very well said Chris. I fully agree. There is no social contract. There is no social licence. And slick promises from industry and government can’t make one with these questions unanswered.